Here it is five days post Ike and I am finally sitting down to put my thoughts on record. There has been a whirlwind (pun intended) of activity, but at the moment I have decided to take a few seconds of quiet time and share our experiences with you. Friday, Ike Eve, was much like any other fall evening when we knew a thunderstorm was coming. The skies were cloudy, the breezes were beginning to cool off the day's heat and dry up some of the thick humidity, to which we Houstonians have all become accustomed. 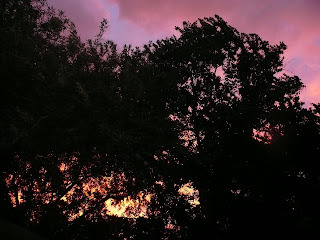 The clouds were robed in pastel hues of crimson, salmon and amber. There was a tinge of excitement, and dread, in the air. What soon overtook the serene peace of the evening was a screaming, howling beast who would rip through our lives and leave thousands homeless and millions devastated. Ike tore into Houston at approximately 2:00 a.m. We knew he was near. We heard his howling announcement. We lay still in our beds, listening to the bumps and crashes outside, praying that our home would remain sturdy and steady in the violent thrashing happening just outside our single-paned windows. At around 6:00 a.m., we heard nothing. There was an eerie calm and scant sunlight as Ike's Eye peered down on us. A few quiet moments later, he began growling and screaming louder than before, as though someone had not taken his tantrum seriously and he was now more determined than ever to get our attention. 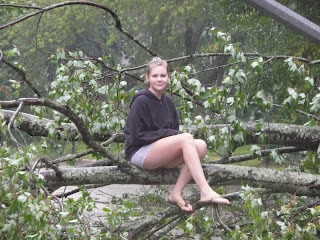 I am happy to have made it through the storm with our home sustaining only minor damage. We had a small leak that came in from underneath a door and did some minor damage to the carpet. 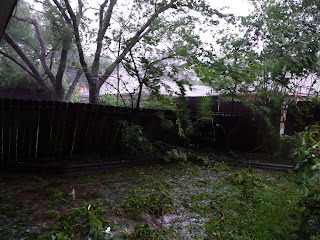 Our back yard fence came down. Otherwise, besides the post-traumatic stress syndrome many of us are experiencing, we did fairly well. In the few days following the storm, everyone without power, all of us, family and neighbors, spent many of our daylight hours outside cleaning up our homes, yards, checking on each other and being thankful to be alive. We did hit a few snags, as would be expected after a disaster of this magnitude. Gas was unavailable. Stores were closed. If people didn't make provisions before the storm hit, they would find themselves in severe need in these few days. Once the power started returning to small sections of town, gas stations and food stores began to open. Folks in gas lines were experiencing three and four hour waits. Stores were letting people enter only a few at a time to get what they could find, if anything. Points of distribution (PODs) were opened in several areas of town. PODs provided ice and water to those in need. We were all in need. 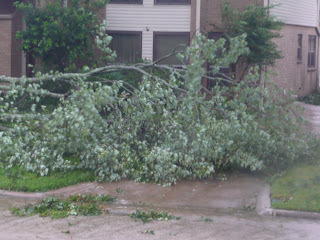 Slowly, neighborhood by neighbohood, power began to be restored. We, my little block of neighbors, are still without power today, thanks to a tree falling on a power line near our section of the neighborhood, while all others around us have power, even those two and three houses to our east. It is disheartening and frustrating, but we are holding out hope that our power will, too, be restored in the few days to follow. On the bright side, God has seento it to bless us with the most incredible cool front. The nights have been in the mid- to upper-60s, and the days have been mild and dry. I can't imagine having to go through these days in the 90- and 100-degree heat, which usually plagues us this time of year. Today, five days later, I am thrilled to report that gas lines are getting shorter, more stores are opening, and lives are beginning to return to normal. My daughter has power in her home, which has restored my hope, somewhat, and given me the opportunity to let you know what has been happening in my little piece of land in Houston. Glad to see you came through it all with a smile on your face. I am so glad lives are beginning to return to normal for you! Over here in PA, on television, we saw such dreadful damage that you all sustained. It was frightening and sad. The news said things wouldn't be back to normal for months.